WWE is going forward with the Crown Jewel event in Riyadh, Saudi Arabia on November 2, the company told investors on Thursday. “Considering the heinous crime committed at the Saudi consulate in Istanbul, the Company faced a very difficult decision as it relates to its event scheduled for November 2 in Riyadh,” WWE wrote in its quarterly report press release, referring to the Kingdom of Saudi Arabia’s admission that journalist Jamal Khashoggi was killed by Saudi government agents on October 2 during Khashoggi’s visit to the Saudi consulate in Turkey. Record profits for the full year of 2018 that WWE is promising investors relies on more big money from running Crown Jewel, which is part of a ten-year agreement with the Saudi government, reportedly worth a total $450 million over the entire term of the deal. WWE’s Q2 report suggested the company already likely received at least $40 million for the Greatest Royal Rumble event in Jeddah, Saudi Arabia in April, a major stadium show that also featured video promoting the government. 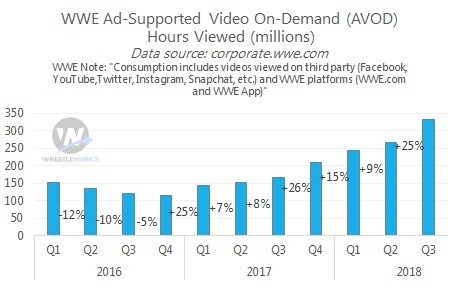 On the conference call, WWE Co-President George Barrios gave a projection of $200 million in adjusted OIBDA for the full year of 2019, when new increasingly lucrative U.S. TV deals go into effect late in that year. During the question-and-answer session, analyst Brandon Ross from BTIG asked WWE Chairman and CEO Vince McMahon to explain his thought process on deciding to go through with the event in Saudi Arabia. Later in the call, Jason Bazinet of Citigroup asked the WWE executives if they could frame what the risk was for continuing the ten-year deal with Saudi Arabia. 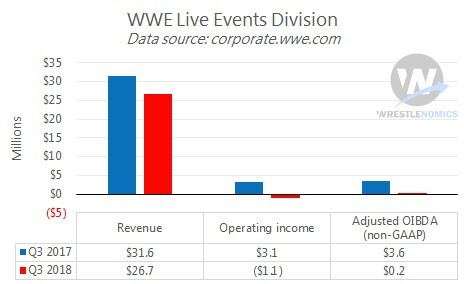 While the company remains strong financially overall, most significantly fortified by guaranteed TV rights revenue, WWE’s live events business (its #3 source of revenue) is hurting. The company actually reported a negative operating income related to live events for the third quarter. 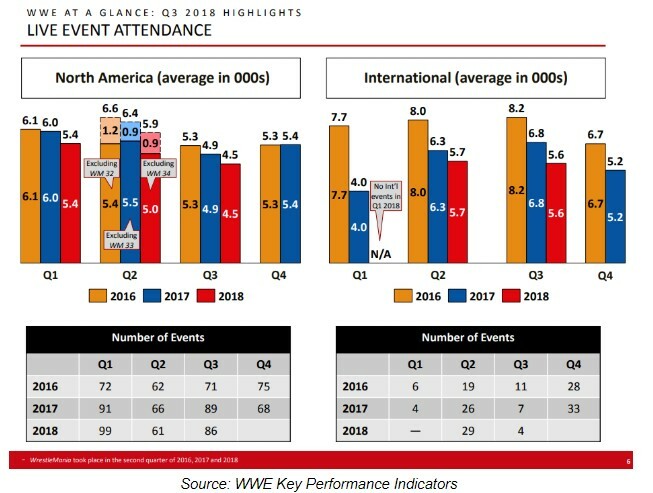 Not only is average attendance showing a pattern of decline in both the North America region (U.S. and Canada) and the International region (everywhere else), but revenue in the Live Events division for Q3 2018 ($26.7 million) was down 16% from Q3 2017 ($31.6 million). McMahon gave a murky explanation, promising WWE would soon “re-imagine” its live events business and turn things around quickly. Running more events than ever had in previous quarters kept event revenues up even as average attendance slipped, but that was not the case this quarter. That was so even as ticket prices for North American events related almost unchanged, ticket prices on international events decreased and revenue from travel packages increased. Sales during the quarter of merchandise at live event venues suffered compared to Q3 2017 also, down to $17.9 million from $19.7 million, or a decline of 8%. Online merchandise orders were slightly up. WWE took in 531,500 orders, compared to 503,700 in the same quarter the prior year. However, average revenue per order was down 6%, with an average order of $43.35, compared to $46.12. The company’s second-largest source of revenue is the WWE Network, which averaged 1,664,000 paid subscribers worldwide throughout Q3. The streaming service continues to show moderately strong growth in quarterly comparisons. The company projected Q4 2018 will show growth as well over Q4 2017. WWE expects average subscribers for next quarter to be 1,560,000, which would be an increase over Q4 2017’s 1,480,000. No news was provided on a forthcoming premium tier of the Network, which WWE hyped during its Business Partner Summit event in April. The company recently put out a survey that hinted at possible features, including archived and current programming from U.K. independent companies Progress and ICW. While operating income was almost cut in half compared to the previous year’s Q3, total company revenues continued to increase during the quarter. Operating income was down to $18.1 million compared to $33.9 million. Adjusted OIBDA (WWE’s favorite non-GAAP measure of profit) was down to $35.8 million from $45.6 million. Revenue was up slightly: $188.4 million versus $186.4 million. As mentioned however WWE maintained its projection that it will report a new record for adjusted OIBDA for the full year of 2018. That report will likely be released some time in late February 2019. 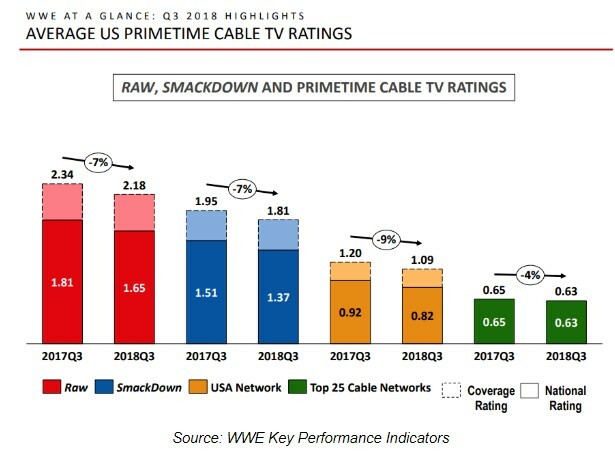 Heading into new increased TV rights deals by this time next year with NBCUniversal and Fox for Raw and Smackdown, respectively, coverage ratings for each programs fell by 7% in Q3 2018 compared to Q3 2017, by WWE’s own reporting in its Key Performance Indicators document. Previously troubled viewership for Raw and Smackdown looked more stable over the last four quarters. 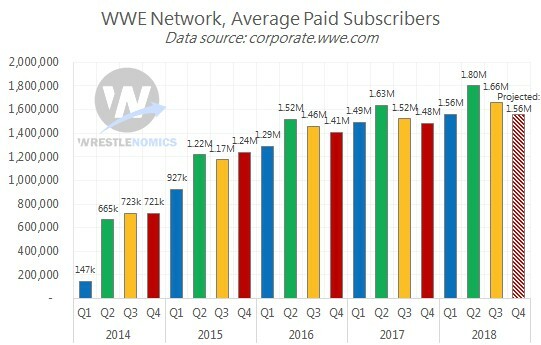 Viewership data gathered from Showbuzzdaily.com and analyzed on the Wrestlenomics podcast showed Raw’s viewership decline leveling off between Q3 2017 and Q2 2018. Over the same period Smackdown hadn’t lost much of the gains it received following the brand split of July 2016. That changed in Q3 2018 when viewership for both Raw fell by 10% and Smackdown by 9%. Wrestlenomics co-host Chris Harrington found that decline was partly driven by a decline in female viewers catching up with an earlier decline in male viewers. 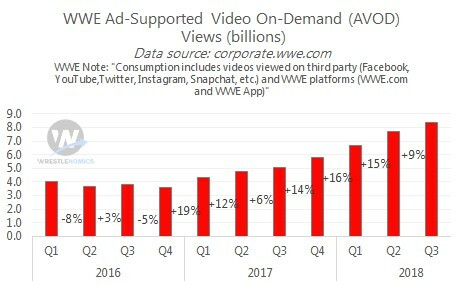 While it’s not a leading driver of revenue, WWE’s presence on online video and social media platforms surged further in Q3. Video hours viewed on platforms like YouTube increased 25% from Q2. It should be noted only two episode of the second season of Mixed Match Challenge occurred in Q3. Most of the episodes will be in Q4. View counts on digital platforms continued to rise, though only up 9%, whereas growth had be racing more quickly in previous quarters. 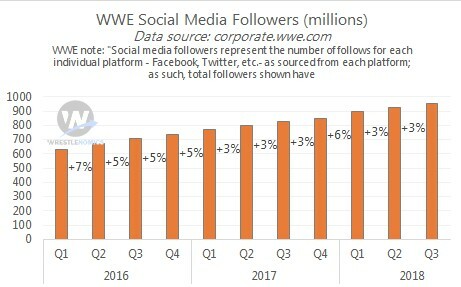 Social media followers grew to 950 million as WWE gets closer to the 1 billion mark. Growth in this area has slowed somewhat over the last few years perhaps as social media platforms ease toward saturation. Despite being the company’s most prominent full-time star, there was no mention of the news that Roman Reigns will be indefinitely absent from programming and live events as he announced on Monday he will be taking time off to fight leukemia. As of this writing, following the news of the quarterly report, WWE’s stock price has been falling by a few percent. Shares fell from $77 to now in the mid- to low-$70s. Overall that’s still way up from the stock price of about $31 at the beginning of the year, before WWE announced its impressive new U.S. TV deals over the spring. Brandon is the co-host of Wrestlenomics, a weekly podcast focusing on the business of pro-wrestling. Wrestlenomics produces a weekly free episode available on all major podcast platforms and a weekly premium episode for subscribers on additional topics.